If you settle in by the Angle Tree and listen, park rangers and battlefield guides will come by with various tourist groups, point fingers and tell tales. Each ranger and guide has favorite regiments, favorite deeds, and tells the tale with a slightly different slant. The books also twist emphasis. Thus, one might nominate several units for war story of the day, July 3rd, 1863. Pickett's Charge meets the Army of the Potomac. North is to the top of the map. Darker Blue and Red indicates fully engaged units. Lighter units were in reserve. Roads in black, woods in green. The stone wall is in violet. The background give height based on USGS data. Units positioned by Coddington's The Gettysburg Campaign, Map 11. About 250 men of the 8th Ohio had been assigned to skirmish against part of Pender's division in the sunken road west of Cemetery Hill. While the 8th was an undersized regiment skirmishing against a brigade, as the tale is told their orders were to hold their assigned position against all hazards. Pettigrews division supported by parts of Heth's certainly counts as "all hazards." The 8th turned to attack, pouring flanking fire into Brockenbrough's brigade. Brockenbrough s people had already been the focus of attention as the best target for the massed batteries on Cemetery Hill. Brockenbrough's was thus the first Confederate unit to turn. The 126th New York followed the 8ths example. Once the limit of the Confederates attack was identified, the units not directly attacked pivoted forward to send in flanking fire. This is the classic response to a column attack against a line. On the opposite side of the attack, the Vermont Brigade also pivoted forward. These were nine month men, short termers, due to be mustered out of the army within a few days. They were viewed as less than professional by the standards of the Army of the Potomac. They proved professional enough. The 16th Vermont launched flanking attacks at two separate columns, first Picketts to their right, then Andersons to their left. In the Center, Picketts Virginians make the claim for having crossed the Union lines, having stepped over the stone wall. To the north, the North Carolina troops may have advanced further east. As stated on a prior page, I shan't say whose is the greater honor. There is sufficient for all. On the Union side of the same stone wall are three monuments to Pennsylvania regiments, the 71st, 72nd, and 69th. With the monuments is a similar controversy. Only one of the three regiments actually stood at the wall and fought. The 71st and 72nd made their stands a few hundred feet to the rear, about the same distance that the Virginia and North Carolina people debate. Again, there ought to be sufficient honor. The 69th Pennsylvania was assigned to the wall at the start of the attack. Their survivors were still at the wall when the fight ended. The 69th was an Irish regiment. This being the time of no Irish need apply, they sought respect as an Irishman of the time generally sought respect. They fought for it. They may not have distinguished sufficiently between fighting the Confederates, the rest of the Army of the Potomac, or each other. Their discipline was rough. Their sergeants were the men who could lick anyone in their company. Their master sergeant was generally the man who could lick the other sergeants. He could generally out drink them as well. He could out drink and out fight anyone except, perhaps, the officers. The 69th was fighting a different war, perhaps, than the rest of the army. However, when told to hold the wall, they held the wall. A half dozen regiments entered the coppice of trees from the left, including the 19th and 20th Massachusetts, the 42nd New York, and the shadow of the 1st Minnesota. Union soldiers came out on the right. No organization or formation survived the passage. Much the same might be said of the Confederates coming over the wall. Brigades marched to the wall. By the time men crossed the wall, there were clumps of men, sometimes following officers. Most of the tales focus on Union units. By the time the wall was crossed, the Confederate units weren't really intact. There was one pattern, however, followed by both sides. There was an line past which prudence overcame courage and duty. Several times, on both sides, men would not advance into critical positions. For the 71st and 72nd Pennsylvania, this was the line of the rear wall. For the Confederates, it was the forward wall. While the fight held in the balance, there was a no mans land, a rectangle formed by the Angle walls and the Coppice of Trees into which few dared tread. But if few would advance into this no mans land, neither would they retreat. Both sides stood their ground, and fired from very short range. Confederate General Armistead was one who did enter this rectangle, and with him a few hundred men. Curiously, at the same time, Union General Webb, after failing to get the 72nd Penn to advance, walked forward to make his stand with the 69th Penn at the wall. Thus, two generals - both advancing on foot - passed within a few paces of one another. There are multiple accounts of how it ended, and no way to confirm which might be true. Some say that when Armistead fell, the fight went out of the Confederates. Union Lt. Haskel tells another story. He urged the 72nd Penn's flag bearer to go forward. He did go forward, but no one followed. Instead, the flag bearer fell. Only then the 72nd went forward. Every other Union man in the area soon followed. Did the Confederates finally collapse, recognizing failure, or did the Union soldiers finally manage to cross that imaginary line past which no man might expect to survive? Did one happen first, to trigger the other, or were both armies so closely interconnected that victory and defeat of necessity came together? During the fighting, Lee, Longstreet, and Pickett made few contributions. The column was sent in motion, to be guided by the brigade commanders in its lead. Hancock was active on the Union side, authorizing reinforcements and the flanking movements of the Vermont Brigade, though he fell towards the end of the fight. Where was Meade? He was in the rear, organizing reinforcements, a second line. About the time prisoners started coming back over the Cemetery Ridge, Meade "...by means of prior arrangements and good management... quickly concentrated almost 13,000 infantrymen from four different corps and every part of his battle line, ready to relieve Hankcock's men should they pressure become to great for them, or to pounce on enemy columns should they break through." * The Confederates had sent 12,000 men forward. 6,000 of them returned. 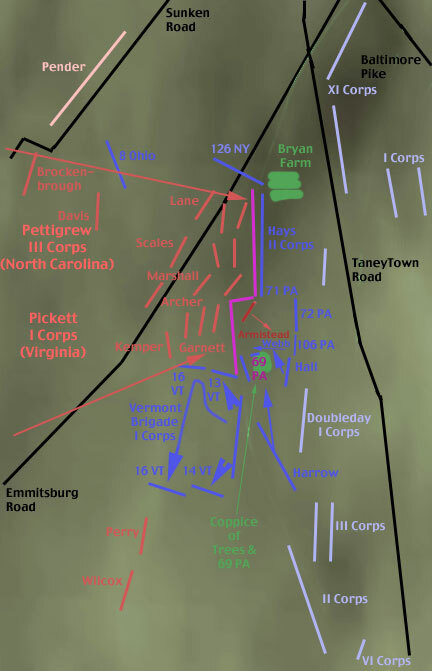 While the fighting was close on the first line, and historians have truthfully presented Hancock's struggle as a close one, in a larger sense, the sense that counts, the July 3rd fighting was not close at all. On July 2nd, whenever Longstreet had come close to a break through, Union reinforcements would appear, generally at the last possible moment. Sickles had moved forward, and the reinforcements had quite some distance to travel. On the 3rd, near the center of Meade's interior line, with Meade's arrangements intact, a larger reinforcement had been possible, a reinforcement greater than the attacking column. These reinforcements were not needed.